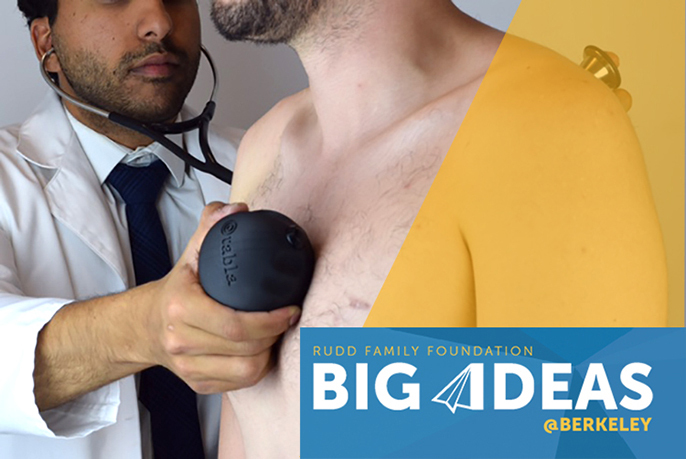 The team that created Tabla, a device that detects pneumonia using sound waves and a stethoscope, received seed funding from Big Ideas @ Berkeley to support its project. In 2015, pneumonia was the leading cause of death in patients under the age of 5, claiming the lives of nearly a million children worldwide, half of whom lived in South Asia and sub-Saharan Africa with limited medical resources. Adam Rao, a bioengineering Ph.D. student at UC Berkeley and medical student at UCSF, is working to change that. With the help of seed funding from the Big Ideas @ Berkeley competition, he created Tabla, a device that uses sound waves to detect the presence of pneumonia. Tabla builds on a basic screen for pneumonia — tapping on a patient’s back to listen for areas of dullness where fluid has built up — which detects only about half of all cases. “Our goal is to take advantage of the simplicity of the physical exam, but quantify its findings using modern sensors,” says Rao. Its prototype is now in testing at UCSF. Tabla is one of dozens of projects funded by Big Ideas. The program, coordinated by the Blum Center for Developing Economies, is a yearlong, annual contest that provides funding, support and encouragement to interdisciplinary teams of undergraduate and graduate students who have creative solutions to address pressing social challenges. Of the record-setting 326 applicants this year, 44 were awarded from $2,000 to $10,000 for their innovations. The applications represent more than 1,000 graduate and undergraduate students from 16 universities, including all 10 UC campuses, with categories ranging from food systems to global health to energy and resource alternatives. This Wednesday, April 26, Rao and his team — Chen Bao and Jorge Ruiz, both master’s students in mechanical engineering at Berkeley — will join six other top teams to compete in the annual Grand Prize Pitch Day to win additional funding for their projects. At the event, teams will give three-minute pitches to a panel of judges, who will award $5,000 to the winning team, $3,000 to two teams in second place, $2,000 to two teams in third and $1,000 to the two teams that come in last. The event is open to the public and RSVP is requested. HomeSlice aims to make shared home ownership a viable and attractive option for millions of Americans by removing the current barriers to fractional ownership, from the creation of co-owner agreements to the elimination of liability for co-owner default. MigRadio, a podcast produced in English and Spanish, will explore U.S. immigration policy through the lens of deported immigrants, telling their personal experiences of U.S. detention facilities and prisons. Undergraduate Lab at Berkeley, a student-run laboratory to help freshmen and sophomores get started in research. ZestBio converts orange peel waste into plastic bottles using eco-friendly conversion technologies. On May 3, Big Ideas will hold its annual awards celebration, where teams will have the opportunity to present their award-winning social innovations, demo their prototypes and speak with industry professionals. The event is open to the public; RSVP is requested. Learn more about Big Ideas @ Berkeley.